Mercedes-Benz Malaysia has launched a new special edition of the A-Class at its NZ Wheels showroom in Bangsar today. Dubbed the A 200 Activity Edition, the new variant comes without the sportier look of the A 200 AMG Line (for those who’d like a more subtle appearance, perhaps), but adds a number of aesthetic tweaks inside and out as well as a bit of extra kit. 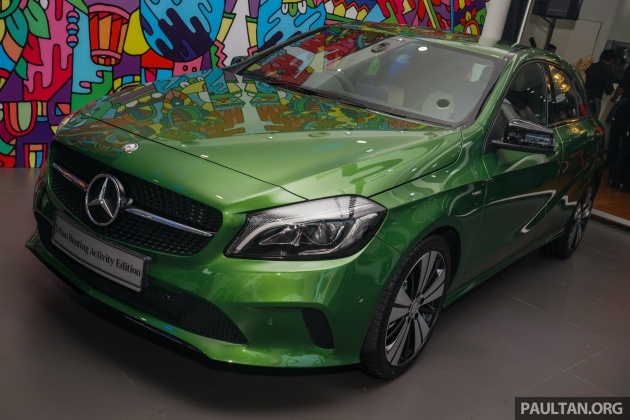 Just 30 units will be made available nationwide, each priced at RM205,888 on-the-road without insurance – exactly the same price as the AMG Line. Included is a four-year, unlimited-mileage warranty. As mentioned, the Activity Edition ditches the AMG Line pack in favour of the less aggressive Urban Line also fitted on the A 180. On top of that, the car is also fitted with the Night Package (consisting of gloss black front and rear bumper strips, wing mirrors and beltline trim), matte black side stripes and a new 18-inch alloy wheel design in black with a machined finish. There’s also Activity Edition badging on the front fenders. Inside, there are new floor mats embedded with Activity Edition script; an “Urban Hunting Activity Edition” plaque, featuring the numbering of each unit in the 30-car series, has also been affixed to the centre cupholder lid. Also equipped is the Exclusive interior package that throws in real leather upholstery, black headlining and a dashboard wrapped in Artico faux leather. Otherwise, standard kit is identical to the AMG Line and includes automatic lights and wipers, power-folding and auto-dimming mirrors, power-adjustable front seats with memory and four-way lumbar support, manual air-conditioning, Parking Pilot, a reverse camera, a basic Audio 20 CD infotainment system and an eight-inch Media Display. A Light and Sight package with ambient lighting and illuminated door sills is included as well. Safety equipment is the same as the rest of the local A-Class range, with seven airbags, Active Brake Assist, Pre-Safe, automatic front passenger airbag deactivation and rear ISOFIX child seat anchors. Power comes from a 156 hp/250 Nm 1.6 litre turbocharged four-cylinder engine, mated to a 7G-DCT seven-speed dual-clutch automatic transmission. Zero to 100 km/h is dispatched in 7.8 seconds, and the car will hit a top speed of 224 km/h. Combined fuel consumption is rated at 5.4 litres per 100 km. Browse full specifications and equipment on all Mercedes-Benz A-Class models, and find the best deals on a new car on CarBase.my. This car is way overpriced. Malaysians are still waiting for the 30% car price reduction promise made to us 4 years ago. Basic promise also don’t know how to keep, how want to keep bigger promise? Utter waste of money. Now can get C200 pre reg brand new for around the same price. Car is so much bigger than this A class, which is a toy car. Most Malaysians cannot even fit into an A class. Let us face facts, the only real Merc is still C E and S class. The A class and B class got even smaller legroom than a Myvi! show me A C200 pre reg brand new for around this price and I will buy from you straight away. Baik beli Elantra Sport. Lagi power. Taknak fwd. Civic tebo ftw! i thought it was Kermit Edition…. Don’t like the look of AMG line? Then don’t drive cars. Well another piece of garbage from Merc. Looks good, but nightmare for owners. Poor driving, overpriced shitbox. Better buy Korean but you wanna pay for the badge so happy you. Lol people like you can’t even dream of owning such cars. Typical keyboard warrior. 1 unit of my car can probably buy 3 units of whatever car you’re driving. could be. But one unit of my car has 100 times the value of your car, seeing that you don’t understand the concept of value. buying a 200k car with manual air con ? u really have more money than brains . i cant imagine having to adjust the fan speed constantly . With our current economy, MBM is trying hard 2 market their products by introducing an Activity Edition in the form of A-class. This shows that the A-class is NOT selling well currently. The fact that there are more C/E-class on our roads tells a whole story. At RM205,888 on-the-road without insurance & only 4 years warranty, this is beyond many buyers. If U want an “ACTIVITY” vehicle than can fill your family with loads of items like going for outing at the beach or fishing, U will buy a proper MPV/SUV. IMO, Mercedes got it wrong with this “Activity Edition” title as this A-class is NOT for anyone who want to use it for Activity. Its more suitable for Mak Datin’s to go shopping alone. The datins prefer use GLC/GLE for shopping. A keras boot too small to storage. A keras is for the son. Veli nice to drive the A keras. A pocket rocket compared to Golf GTI. Especially A250, din feel a thing @180kmph. Suspension is tight at corners, but soak up bumps. NVH cant hear much engine noise. Only thing is the floating ipad is stupid. Honestly speaking the A class really sux compared to the rest of the line ups. Good car for rich aunties to go marketing or shopping la although a Mini is preferred most of the time. Previous Post: PANDU UJI: Honda BR-V – adakah ia benar-benar mampu memenuhi jangkaan bagi kegunaan keluarga?